For more information, see Landed Hong Kong. Tonight, I’ll tell you how I came to own half a floor in a factory building near Aberdeen; I’ll also describe the renovation process; the hunt for a business to fill the space; what it was like to work there for five years; and finally the decision in the fall of 2010 to sell the unit. I live in Pokfulam. On the weekends, my family would often drive to Repulse Bay, Stanley, Shek O and other destinations on the south side of Hong Kong Island. 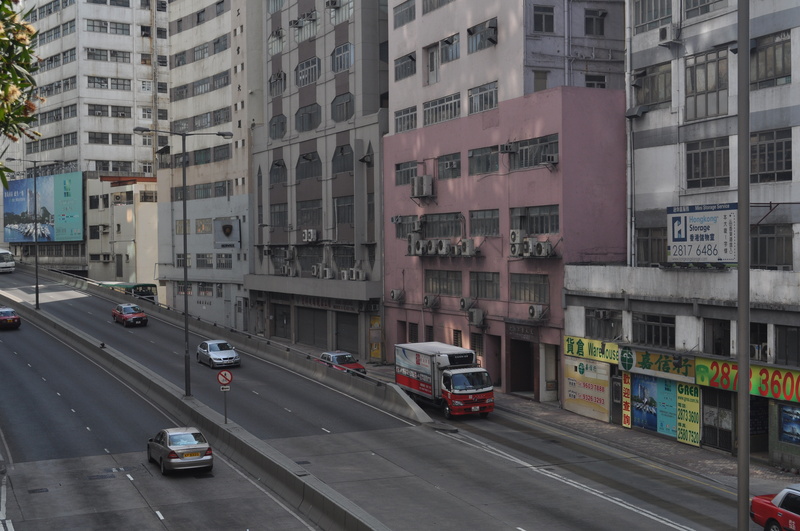 That trip would take us through Wong Chuk Hang, a series of factory buildings sandwiched between working-class Aberdeen, and Shouson Hill, which is one of Hong Kong’s more exclusive neighborhoods. On those trips, I couldn’t help noticing how out-of-place Wong Chuk Hang’s factory buildings were in Hong Kong’s modern, service-based economy. From reading the papers, I knew Hong Kong’s industrial base was moving to Southern China. So I thought these factory buildings might represent a redevelopment opportunity. So I spent a couple of Sunday mornings wandering around industrial buildings. At first, I was a little nervous that I’d be hassled by security guards. But I acted like I belonged there and I had a secret weapon—my then five year old daughter Lindsey – who accompanied me on my expeditions. No one batted an eye. I was looking for a space that would be an interesting work environment and offer the potential for capital gains. One of the first things that I learned was that Hong Kong industrial space has more in common with a scene from a Charles Dickens novel than it does with a New York loft. Some buildings offer big windows and high ceilings. But you can forget about interesting architectural details like pressed-tin ceilings, hardwood floors, ornate ironwork and elaborate masonry. I looked at dozens of industrial buildings, many of which were truly horrible. Prices for industrial space fell dramatically in the wake of the Asian Financial Crisis in 1997, and prices were hit again when China opened its doors and Hong Kong manufacturers began moving across the border. That left many owners with negative equity and made them even less likely to spend money on repairs. And, because these were factories, there wasn’t much emphasis on cleanliness or aesthetics in general. Eventually, I found a unit that had been home to the New China Steam Laundry. It was about 3,500 square feet and occupied half a floor on the back of this building. So I made an offer, which was verbally accepted. However, at the last minute the agent told me that there was a “problem,” and that the vendor had pulled-out of the sale. Curiously enough, a week later, the problem had been solved and the unit was back on the market. But now, there was a new vendor, as the agent had found a confirmor, a buyer who flips the property without ever taking possession. I could still buy the property, but the price was HK$260,000 higher. At that point, I investigated a mortgage to finance the purchase. My assistant called several banks and finance companies. Between their below-market valuations, low loan-to-valuation ratios and above-prime interest rates, it quickly became apparent that I was going to pay cash. Despite feeling like I had been taken to the cleaners, I went ahead with the deal. And on April 19, 2005, I signed a provisional sale and purchase agreement. My next challenge was to find an application for the space. I had two goals. First, I wanted to generate some cash with a new business, which I hoped would be a “hands-off” enterprise. Second, I wanted to use a space that was zoned “industrial” as my office, which is a commercial application. The last part is important, because zoning regulations dictate what you can and cannot do in an industrial property. In general, putting an office in a factory building is forbidden, unless the office is related to an industrial activity that is taking place there, and the office occupies a small part of the total floor space. It’s possible to change the zoning from industrial to commercial, but this is expensive and time-consuming, and is usually done for the whole building, like this building in Wong Chuk Hang that was converted from the Tingkwan Metal Manufactory to the BT Center, which now houses a golf school among other non-industrial businesses. I looked at a variety of businesses that had been used to re-purpose industrial space elsewhere, things like practice studios for musicians and self-storage facilities. Ultimately, I dismissed these ideas because they would require a large investment in renovations and equipment. They also involved a retail clientele, and I would have had to hire and manage additional staff. I got the neighborhood’s zoning plan and discovered that multimedia production was an approved application, and that I could have an office as part of a production facility. So I decided to build a rental studio. Before I tell you about building the studio, let me describe the condition that the space was in when I bought it. To say the unit was rough would be an understatement. The previous tenant removed all of the internal partitions, electrical outlets and lighting. But they left behind a lot of garbage. And it was astonishingly dirty – one corner that had housed a boiler was black with soot. The factory did have some charms, though. The ceilings were 12 feet high. And the large windows and southern exposure meant there was lots of natural light. The factory also had a green view. A family of eagles nest on the roof of the building on the left. And at dusk, hundreds of egrets that live in these trees came out to feed on the fish in the nullah. From my window, you could also see Wong Chuk Hang Estate, a 1960s-era housing project that was once home to 15,000 people who worked in the nearby factories. The estate has been demolished to make way for the Mass Transit Railway’s new South Island Line. At the end of May 2005, I took possession of the factory. While the deal was closing, I learned how others had converted factories in Canada, the Philippines, the US and the UK into studios. I borrowed a lot of their ideas and created a multilingual website, a marketing plan and an interior design. I decided to divide the space in two with a brick wall — shown here in red — and built a meeting room. We also installed a kitchenette, toilet and shower, with the office doing double-duty as daylight studio. Here’s the wall that divides the main studio from the office. When you renovate an industrial space, you can work 24/7, without worrying about the neighbors. Here’s the main studio, before the floors had been finished. On July 1, 2005, we moved in and Dillon Studios opened for business. Here’s the main studio after the renovations. We installed new windows, which were blacked-out to give photographers control over the light. We built a lighting grid in the ceiling and added a selection of background paper, stands and other accessories. We added makeup stations with salon chairs and an industrial grade sound system. And we built a green screen, which lets you add and subtract backgrounds electronically on video shoots. Here’s the reception area. On the right, you can see the entrance to the kitchenette and bathroom. Here’s the client lounge. The daylight studio had a lot of natural light. In fact, we rarely turned on the overhead lights unless we were working at night. Here’s my office, at the far end of the daylight studio. All together, the conversion took two months and cost about HK$250,000, including materials and labor. In hindsight, the studio was both a success and a failure. It was a failure because—if I had been renting the space and counting on the revenue to feed my family—the numbers didn’t work. We had some great clients, like Sony, MTV, Vidal Sassoon and De Beers, and several photographers and production companies considered Dillon Studios to be their “home” studio. But there simply wasn’t enough business, at a high enough rate, to make it commercially worthwhile. I could have increased the volume that by doing “open shoots,” where you hire a model and charge amateur photographers a couple of hundred Hong Kong dollars each to shoot the model, but that wasn’t worth the time and aggravation. The studio might also have been more viable if I was a professional photographer and could use it for my own shoots. But Dillon Studios was a success in several other key respects. First, it gave me a way to work out of an industrial building for five years, while property values were rising. Second, I learned an enormous amount about real estate. Those lessons went into a book that became the first in a series. And I worked with many interesting people and threw some good parties. So what’s it like to work in one of these buildings? In a word, it’s different. If you’re used to working in an office tower in Central, the best analogy would be to compare it to moving from an apartment in Mid-levels to a village house in the New Territories. You have more space, you are physically removed from many things, and you need to slow down and adapt yourself to new surroundings. Environmental issues are one of the most important realities. Factory buildings can be noisy during the day, especially if your neighbors are making things. And industrial space is not designed to be quiet. There are lots of hard, parallel surfaces and very little acoustic insulation. That makes these spaces less than ideal for shooting video with sound. Then there are health and safety concerns, such as the lack of fire sprinklers in older buildings and the toxic chemicals that were—and continue to be—used in many industrial buildings. These units are sold on an “as-is” basis and there are no guarantees that any toxic chemicals that were used there have been properly cleaned up. So, caveat emptor. Heating and air-conditioning is also a consideration. High ceilings, and large, open spaces are expensive to heat and cool. You may want to budget for internal partitions. Second, maintenance and repairs can be a problem. Many industrial units are owned by investors who are waiting for the building or neighborhood to be redeveloped. The unit may be empty, because rents are low and it’s easier to sell without a tenant. And even if the unit is tenanted, many owners refuse to spend money, even for repairs that are legally agreed by the owners’ committee. Lawsuits are often used to force owners to pay for essential repairs to electrical systems, lifts and leaking roofs. At one point, our owners’ committee passed a resolution to start a renovation. The plans were approved and the committee began collecting money. After months of meetings and negotiations, the plan was abandoned because some owners refused to pay their share. Deposits were returned to those who cooperated and the repairs were completed three years later. In the meantime, the building continued to deteriorate. Incidentally, those repairs cost about HK$140,000. And they covered the bare essentials, leaving a significant number of things unfixed. So, you’ll want to budge for general building repairs, in addition to your purchase and fitting out costs. A lot of these buildings were erected as cheaply as possible, and that was reflected in the building’s fit and finish. For example, my floors were not level and the exterior walls leaked. When I would arrive after a heavy rainstorm, I’d find puddles throughout the studio. And at one point, we had a flood when a water pipe supplying the fire hoses broke. These things don’t happen in every building, but they’re not unusual. This picture illustrates two common problems: cracks, shown in red, and spalling, shown in green. This photo was taken before I moved in, and both problems were repaired repeatedly. But because of underlying structural issues, the cracks would reappear and the concrete would flake off shortly after it was fixed. That’s because when repairs are made, they’re often made cheaply. You’ll see elevators that should be replaced, get fixed over and over again, despite the fact that it’s false economy. Trying to fight this is pointless, and will not endear you to your neighbors. Over the years, there has been a shift in the businesses that occupy the city’s industrial buildings. Hong Kong had a vibrant light-manufacturing sector, but these industries have pretty much left. Those that remain include printers and commercial laundries, food factories, warehouses, distribution centers and recycling facilities. As neighbors, some of these businesses are more desirable than others. If you are thinking of buying and occupying an industrial unit, you’ll want to see what businesses are now in the building and what activities are permitted in the zoning plan. I was lucky. The company I shared a floor with made a traditional Chinese medicine that used peppermint oil as one of its main ingredients. When they were at work, my office smelled like a cross between a candy shop and an aromatherapy salon. A little later, however, a meat wholesaler rented a high floor in my building. Each morning, they’d load trucks with frozen chicken, beef and fish, which would be delivered to restaurants throughout the city. In the afternoons, they would receive 45-foot containers of frozen food from Canada, Brazil and the United States. That meant the freight elevators were always full. And pallets of frozen meat would often be left in the elevators, where they would slowly melt leaving puddles of blood on the floor, much to the delight of the local cockroach population. The people who work in industrial buildings can be a little rough. I was never concerned about my safety, and never had anything stolen, but there were minor issues with things like obscene graffiti in the freight elevators. This may not bother you, but it could upset your customers. You may also find you are the building’s only gweilo owner. Owners’ committee meetings are usually held in Cantonese, and if you are not bilingual, you’ll need to send someone in your place or let the good sense and natural stinginess of your co-owners prevail. You may also have trouble finding places to eat lunch nearby. In some industrial neighborhoods, the only F&B outlets are factory canteens that are closed to the general public. Despite these challenges, I enjoyed the five years I spent working here. And planning and executing the conversion was one of the most interesting projects that I’ve undertaken. One thing that I especially enjoyed was the announcement that the Mass Transit Railway would be building a new train line outside my window. As you might expect, that had a positive effect on valuations. The price increase, and the realization that the area was going to be turned upside-down for several years as the railway line was built, prompted me to sell. It also reinforced one of the lessons that I’ve learned, which is that it is preferable to sell into a market that is rising. So that’s what I did. The studio was easy to sell because it “showed well” to prospective buyers, while most of the other properties in the area looked like the “before” pictures. That advantage was unusual because, in Hong Kong, buyers generally don’t care about the interior of a property, because they will gut it anyhow. So that—in a nutshell—is my experience owning industrial property in Hong Kong. But before I wrap up, I’d like to address one very common question: Can I convert one of Hong Kong’s old factories into a loft apartment? And the answer is that yes, you can. The only problem is that you cannot—legally—live in it. For the record, I don’t recommend breaking the law. But if you do decide to live in a factory building, and I have known several people who have done it, there are a few things that you need to know. First, remember the noise and environmental issues that I mentioned. You’ll want to think carefully before exposing yourself and your family to asbestos and other dangerous substances that were used in many of these buildings. This is particularly true for small children, who are affected by environmental contamination to a much greater degree than adults. Second, government inspectors will appear every couple of months. We received regular visits from the immigration, fire and buildings departments. This was never a problem for us, but it might be if the inspector found you were living there. Should the government decide to prosecute, you could be liable for fines. You could also suffer loss if the government begins enforcing existing laws more rigorously or introduces new regulations. You’ll also want to maintain good relationships with security guards and your neighbors, who can “rat you out” if you annoy them. And remember that it is illegal to use these buildings for a residence. If you can manage these issues, you may find that owning an industrial premises is an interesting and profitable experience. A video of Re-purposing Industrial Property in Hong Kong is available here.